Tennis elbow is a painful problem for those of us who enjoy our tennis and the search for tennis elbow treatment and cures is widespread. Thankfully tennis elbow treatment can be very successful if you take the time to go to a chartered physiotherapist who understands the underlying causes of tennis elbow and how to cure it. 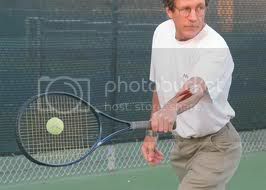 With Wimbledon on the horizon, I have fond memories of playing tennis in the sun and watching greats like Bjorn Borg, Jimmy Connors, Martina Navratilova and Chris Evert on the big stage. It’s a timely reminder of one of the common conditions which the sport has given its name to but which actually occurs in many other situations. Tennis elbow has become a term which is widely used to describe a variety of pains on the outer side of the elbow. But to tennis elbow is in fact tendinitis -an inflammation of the forearm tendons tendon which attach to the bony prominence on the upper elbow. It is essentially an overuse injury which occurs as a result of prolonged ripping activities or repetitive grasping actions using high muscle force. Although associated with tennis, it is very common in gardening, DIY, and occupational overuse injuries. It is a notoriously stubborn condition to settle and can be complicated by elbow joint and nerve involvement as well as a degenerative change in attendance if the condition persists for long periods of time. How do I know if I have tennis elbow? The most common type of tennis elbow presents with specific pain located on the outer side of the elbow you see right on the bone but can extend into the forearm. It is aggravated by the grip such as lifting a kettle, changing gears, keyboard activity and shaking hands. If your tennis elbow is of a more complex nature there can be symptoms of throbbing, sharp stabbing pain, joint stiffness or pain spreading into different regions of the arm. The type of treatment required depends on the severity and complexity of the Condition. The simplest form of tennis elbow can settle within a few days of rest or may possibly require some anti-therapy measures. However, if symptoms persist for more than a week it is advisable to be assessed by a chartered physiotherapists who can examine and treat in the most effective manner. This usually involves combinations of physical treatments using manipulation, soft tissue massage, dry needling, nerve desensitizing movements and a specific strengthening program to regain normal function. If you think you may have tennis elbow or know someone who does (you’ll know because they usually complain regularly!). Feel free to call us on 01 88291744 to schedule an appointment, get advice on whether physiotherapy is appropriate for you or just to clarify any points of concern. Dublin physio has successfully treated countless sufferers of tennis elbow-please call 88291744 or use the convenient contact form below.